This recipe is one of my favorite ways to eat tofu EVER. This happens to be how they cook the tofu at my favorite vegetarian restaurant, The Grit. (You can order their awesome cookbook here if you want to. I highly recommend it! Please note it is not 100% vegan, though many recipes can be veganized. You have GOT to try the yeast gravy!! Sometimes I just want to order a side of that with a spoon!) 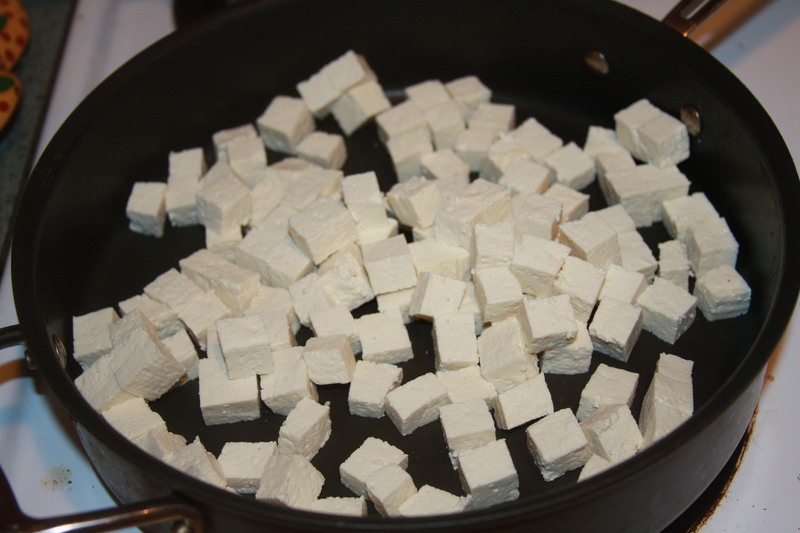 We eat this tofu by itself, as a side, stir fried with veggies & rice, or sometimes we even toss it into a pot roast. It is really easy and oh so yummy!! This fried tofu is one of those foods that you just gotta spoil yourself with and indulge in from time to time… It definitely makes it into my list of comfort foods. All you need to make this is a non-stick skillet, a block of tofu, olive oil, soy sauce and nutritional yeast. Maybe I shouldn’t tell you this, but we often find ourselves fighting like vultures over the last pieces! Hahahaha… seriously. Gather ye ingredients: olive oil, a block of tofu, soy sauce, nutritional yeast. Vegetable oil also works just as well. 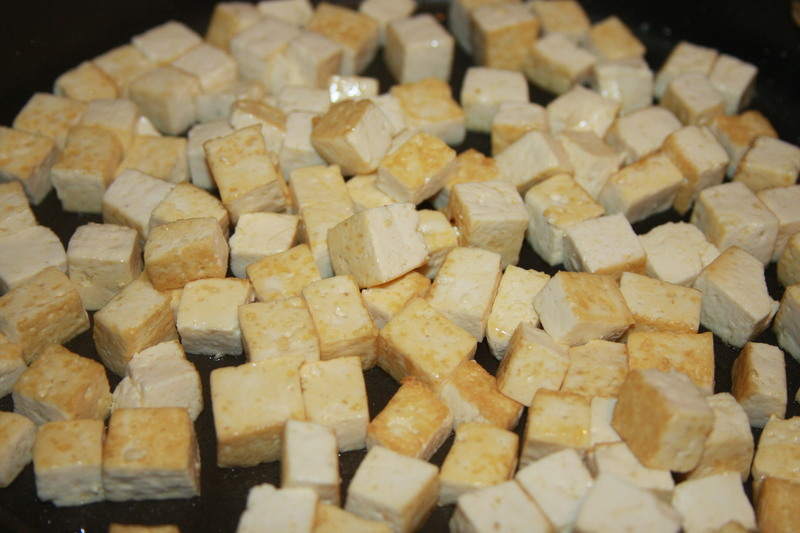 1) Cut tofu into cubes, about the size of dice. Lightly oil a non-stick skillet over high heat. Add a small amount of oil and allow it to heat slightly then add tofu. Saute, tossing until evenly lightly browned. 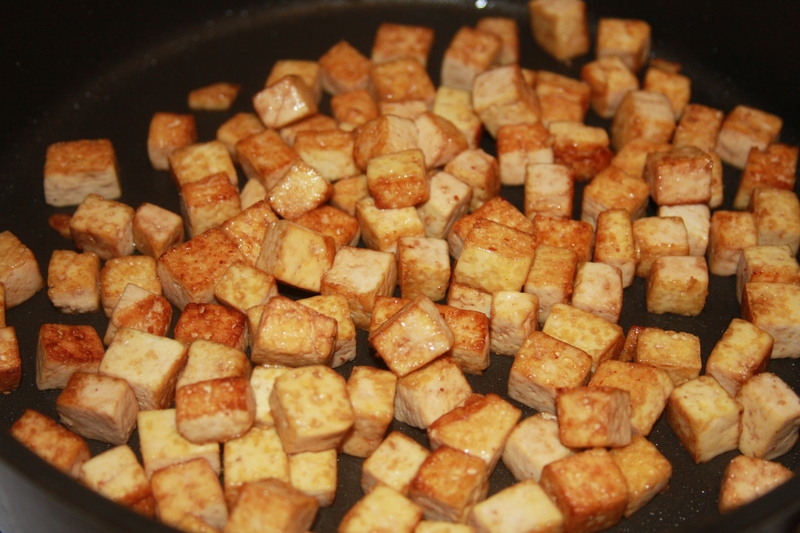 Sprinkle lightly with soy sauce, saute briefly again to further brown the tofu. Remove from skillet. 2) Rinse and wipe skillet dry. Lightly oil skillet again and place over high heat. Allow the oil to become very hot then add the tofu. Saute, tossing constantly until very well browned. Sprinkle with soy sauce to taste, then sprinkle with nutritional yeast to coat the cubes. Saute several more seconds then remove from heat and serve! The finished product. 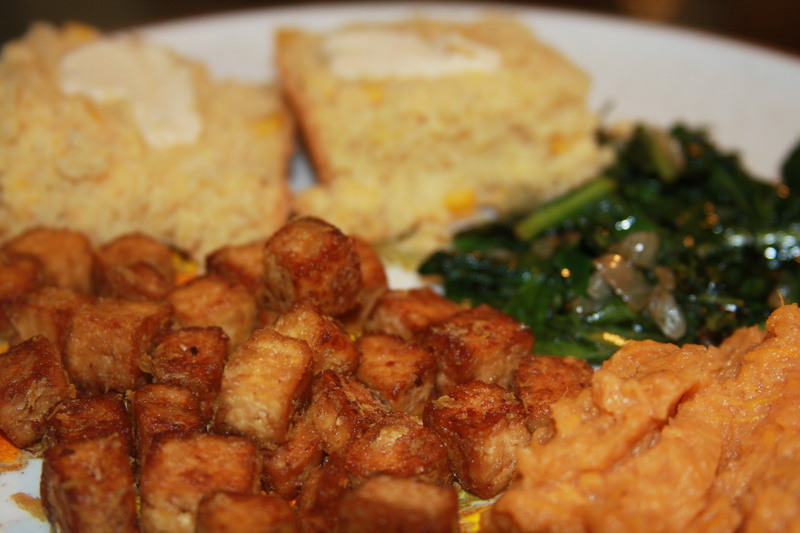 Fried tofu, served alongside veggies of choice (in this case, homemade cornbread, sauteed sesame-collards and mashed sweet potatoes). This entry was posted in appetizers, dinner, fall, holidays, lunch, snacks, tofu and tagged golden tofu, grit style tofu, vegan stir fried tofu, vegan tofu. Bookmark the permalink.